One of the big differentiators of the different CAM programs seems to be the flexibility and choices they give for toolpaths. There are a lot of different ways a CAM program could choose to generate a toolpath, and that choice will affect the speed and surface finish of the resulting cuts. On this page I’ve tried to round up as many different toolpath strategies as I could find in order to try to understand what the differences are. It is important to note that the most sophisticated CAM programs approach the problem with the assumption that multiple specialized toolpath strategies may be used to produce the part as efficiently as possible. For example, plunge roughing may be used to rough the part, an intermediate roughing strategy such as zig-zag roughing would follow, and finally a toolpath such as two linear machining paths on crossed axes might be used to create the final finish. 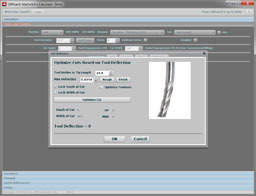 Choosing the right toolpath is one way to improve the efficiency of the program. Once you exhaust the possibilities of toolpaths and options on your CAM software, the next level of optimization is to tackle the hand optimizing the g-code. An important term to understand is Tool Engagement Angle (TEA): The amount of circumference of the cutter in degrees that is engaged in cutting at any point in the toolpath. The larger the maximum TEA, the more stress is put on the cutter. Check out the High Speed Machining page for more details on how cutter engagement factors in. surface between two curves. + Convenience and ease of use. Constant Scallop Height Machining See “Constant Z Machining”. used for steep walls, with another strategy applied to other situations. height.- Use is restricted to steep walls. has the tool ramp into the cut along a helical arc. first, and uses another more optimal strategy for the slopes. fine surface finish to contoured parts.Generally used for finishing passes. to the pencil milling pass. powerful rest machining, pencil milling is not needed. + Very high surface finish. – Unnecessary complication when rest milling is available. the Z-axis, much like plunging a drill repeatedly into the workpiece. + May result in higher performance when roughing. Raster Finishing See “Linear Machining”, it’s the same thing. to be used for roughing, followed by smaller cutters for finishing. to smooth out toolpaths generated by that CAM program. that feed rates can be optimized for that path more easily. + Higher cutting speeds, longer tool life. – Trochoidal machining is an early HSM toolpath that avoids sharp corners. The big loops can waste a lot of travel compared to newer strategies. line motion of the cutter. It is used for 3D profiling operations. next cut.- Back and forth zig zags alternate climb with conventional milling. 3d toolpaths are more specialized. We have a great article with full details on 3d CAM Toolpaths.